What is this line and what is it good for? “I have actually visited the line, only once or twice in my lifetime, even though I have lived around it my whole life”. “You think we are talking about a millimetric space, but no. We are talking about a band. About a valley. A few years ago, a hiker was climbing the volcano Cayambe, in Ecuador. As he ascended, he remarked: “This is the only place on earth, where the line touches the snow”. As I grew up, in between volcanoes, lack of oxygen and an unforgiving sun, I learned as all the people around me, about this “imaginary line” and what did it mean to be born in the Equator. First of all, we did not draw this line. It was traced and measured in 1736 by a group of French geodesics, led by Charles Marie de la Condamine, who came to “Latitude 0” to determine the “real” shape of our planet. Since that day, we, Ecuadorians, see ourselves as the “inhabitants” of the Equator, and even though it crosses many other countries and territories, we feel we are the owners of the line. We are proud of it. We mention it when someone asks us: “So, what is Ecuador famous for?” We never miss a chance to explain how water moves differently in the Northern and Southern Hemispheres and how does it move when you are actually on top of the line. The division is clear: There are North and South, Cancer and Capricorn, Latitude 0. There is where we live and we remain. The line is fixed. The separation is graspable. Since we know the line, there is an inexhaustible need to keep on searching for that frontier. The line is a clear example of how the imaginary has a real impact on the building of nation-state. The Imaginary Line is now a big part of our national collective identity. The Equator is a space “in between”, it is a space of negotiation and then again, we did not trace it. We never saw it, but we believed it was there. Further along, we embraced it. In 1936, a 10-meter high monument was erected in San Antonio de Pichincha, where a yellow line that emerged from it, decorated the concrete floor, dividing North and South. 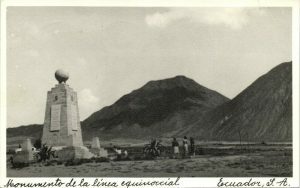 Nevertheless, in 1979, the monument was moved 7km to the west, to the suburban neighborhood of Calacalí, where the Equator line “really was”. The area around the monument was then named “City Center of the World” and is in the middle of an extended slum, where poverty stretches as far as our eyes can see. The fenced “City Center of the World” commemorates the geodesic mission of the XVIII century when once again, the other, taught us, how to see and how to value our own land. As an untouched and undiscovered treasure, the Imaginary Line is now a material metaphor of our dislocated identity. Always in between Cristopher Columbus and Atahualpa, between the Spanish, the Indigenous and the Black, between the slums and the country clubs, between the Spanish and the Quechua. We are always looking for that something inside us, we are too close to see. In the end of the XXth Century, when the GPS technology was readily available, it was discovered once again, that the measurements were wrong. The line is actually 240 m away from the monument, on top of the parallel (0º 0′ 7.83″ Latitude South). The monument was not moved anymore.